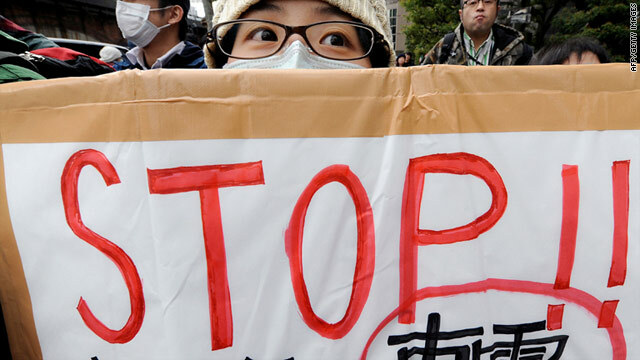 Demonstrators outside the Tokyo Electric Power Company building in Tokyo on Sunday call for an end to nuclear power. Tokyo (CNN) -- Already grappling with a nuclear accident stemming from a historic earthquake, Japan's largest utility is now facing a sharp loss of public confidence and what it says are threats to its employees. In daily press conferences, spokesmen for the Tokyo Electric Power Company have told reporters that they're doing their best to bring an end to a crisis that has forced them to repeatedly improvise new solutions. But the company has had to retract key data about conditions at the Fukushima Daiichi nuclear power plant in the past week. And its financial future has been clouded by the amount of compensation it will have to pay in the disaster's wake -- a step company spokesman Junichi Masumoto acknowledged Sunday night that it has "yet to make any concrete plans about." Criticism has grown almost daily, with 40,000 public complaints coming into their offices daily, the company says. Its president, Masataka Shimizu, was hospitalized last week due to "fatigue and stress," with company chairman Tsunehisa Katsumata taking over in his absence. And the utility faced more tough questions Sunday, when it disclosed that it had found the bodies of two missing workers in the basement of the No. 4 reactor's turbine plant four days earlier. Spokesmen said they held off reporting the discovery in order to notify the families and discuss with them how to announce the news about the two men, who had been missing since the March 11 earthquake. In Tokyo, police have been assigned to guard company dormitories and the utility's downtown Tokyo headquarters. Scores of officers were posted outside the flagship building Sunday afternoon as 250 people turned out on a damp, chilly day to call for an end to nuclear power. "It's high time we abolished nuclear power plants," said Makoto Yanagida, the co-director of the anti-nuclear group Tanpopo ("Dandelion") House, which organized the rally. "We are calling on those responsible for the disaster to stop nuclear power and protect our posterity." Demonstrators included longtime anti-nuclear activists, rappers, drummers, a guitarist and a female impersonator holding aloft a sign telling Japan's government, "Shame on you." They marched from TEPCO's headquarters to the building that houses Japan's Ministry of the Economy, Trade and Industry, about four blocks away. Critics like Hiroko Ike, one of Sunday's marchers, say the close ties between the utility and the government make it hard for her to believe official pronouncements about the crisis. "I can't believe the government any more," said Ike, a 32-year-old Tokyo woman. "It sounds stupid, but I want to escape Japan." She said most Japanese oppose nuclear energy -- "But I think our opinion doesn't have any power to our government." A poll released by the Kyodo News Agency in late March found Japan split evenly on nuclear energy, with about 47 percent who want power plants shut down and the same number supporting atomic power. Online, however, calls for company officials to be punished have proliferated. "How to execute a TEPCO executive" was one line of commentary, with several suggesting the utility's bosses should be forced into the damaged plant. Company officials have seen their salaries -- and home addresses -- spread across the internet, and photos of a dormitory that houses workers in one Tokyo neighborhood also were posted. And when CNN tried to interview people at the facility, six police officers quickly showed up. "The people who live here are nervous," a company manager explained. "This is all because of the Fukushima incident." CNN's Kyung Lah, Whitney Hurst and Shiro Takata contributed to this report.